Not too long ago, one of the most extraordinary weeks in the history of the University of Missouri football program unfolded before the eyes of a nation. From Saturday, Nov. 7 through Saturday, Nov. 14, the Tigers endured (and to some degree created) a level of upheaval unmatched by any other program this season… and in recent college football memory. On Nov. 7, some Mizzou football players announced they would boycott team activities if university system president Tim Wolfe did not leave his post. That boycott joined the protests of other students on the campus, particularly a hunger strike by a man named Jonathan Butler. A few days later, Wolfe did step down. Missouri prepared for its game against BYU on Nov. 14. One day before that game — Friday, Nov. 13 — longtime coach Gary Pinkel, a disciple of legendary and late University of Washington coach Don James, announced his retirement due to health reasons. A player boycott as part of a campus protest. A university president’s exit. A coach’s retirement. An emotional win over BYU. All those events happened to Missouri football in one week. This past Friday, Missouri’s 12-game regular season came to an end, as Pinkel coached his final regular-season game in a loss to Arkansas. The defeat moved the Tigers’ record to 5-7, but they were one of the first two schools in line to qualify for a bowl. You might have read about the shortage of 6-6 bowl teams earlier on Monday at The Comeback. 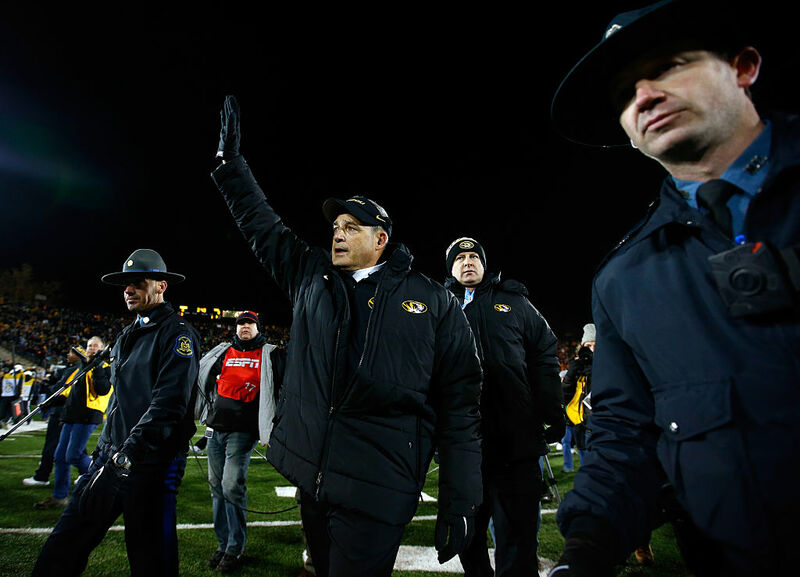 Pinkel had a chance to coach one more game in his career and enjoy a prolonged sendoff. However, Missouri athletic director Mack Rhoades released a statement on Monday afternoon saying that the Tigers would not pursue a bowl bid. It makes perfect sense that Missouri should focus on the transition to a new coach, which it has not yet hired. The lack of bowl practices represents a tangible drawback of the decision, but without a named successor, the impact of that is marginal. Having Pinkel preside over those practices would put the program in an in-between position. Pinkel almost surely had some input in the matter. That Missouri is not insisting on playing in a bowl would suggest — if not outrightly indicate — that coaching in a bowl under these circumstances was just not worth it. Given how much the university and the football program have been through — and even though Pinkel nostalgia might have boosted bowl attendance to some degree — the bowl destination (at or near the bottom of the pecking order) probably wasn’t going to be attractive enough to merit acceptance of a bid. It probably is in the best interests of everyone involved to take a rest — not just from 12 games of a difficult season, but from that extraordinary week in November when a school encountered a level of tumult and turmoil not seen on many FBS campuses. Georgia and South Carolina — two competitors of Missouri in the SEC East — have (as of Monday evening) not yet hired their head coaches. As long as the Tigers find the right successor to Gary Pinkel, they’ll be in good position. Passing up extra bowl practices will be quickly forgotten by many, if not everyone.